After some crazy traveling over the last five days, I’m back at the price-themed gifts. Today it’s all about the Benjamin’s baby. 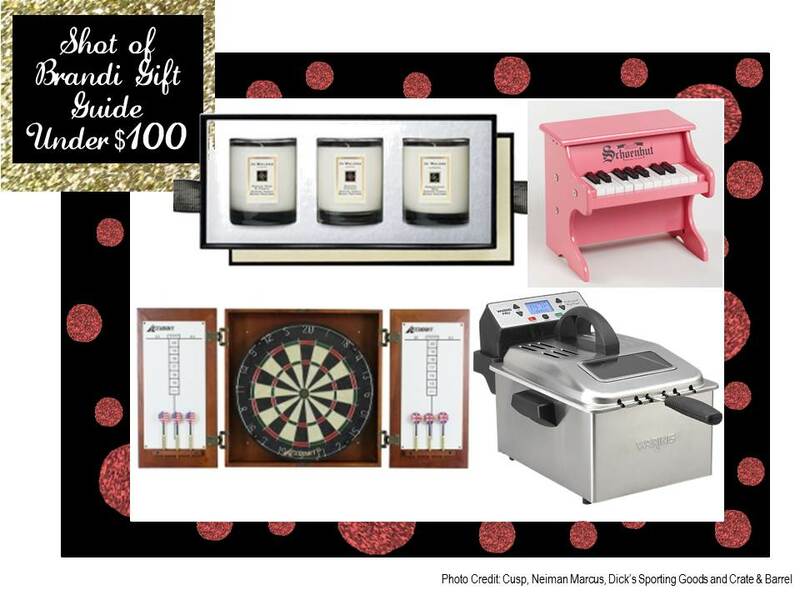 These gifts are all under $100. I think some of my selections will surprise you – they are everyday items, but just a bit more expensive than you would normally pay. It’s the holidays – go big or stay home. · Jo Malone Candle Set: When I see people spending a lot of money for something, I become intrigued. Like Lululemon – are those pants really worth $100? One overpriced item I decided to test out for myself was a Jo Malone Candle. Uh huh, I get it now. These things ARE worth the $50. The scents are more unique than the ones you would find in a Yankee Candle. · Piano: Throwback Shot of Brandi* had one of these as a tyke. It’s where I learned how to play NKOTB Hanging Tough. This will annoy parents, but it’s just oh so cute! · Dart Board: I always select a game to make it on my list. This year, I’m unaware of what the hottest board game is, so I decided to include a game typically found in a bar – a dart board. For those friends that are getting too old to go out to the bars, bring the bar games to your house! · Cooking Class: As I’ve said in previous years, this gift isn’t meant to insult someone by saying they can’t cook – it’s more about taking a class to learn new recipes and tricks! It’s also an opportunity to chat with a chef about questions you may have in the kitchen. In Pittsburgh, I recommend Chop, Wok, Talk. They have a great class topics for $65. · Deep Fryer: I previously wrote that frying parties are the new rage…you bring food to the hosts house and then fry it! So why not be unhealthy and buy a fryer! Funnel cakes for all!